Now a days, Internet is a part of everybody’s life, can you imagine any life without the Internet. Mainly, Internet is used by the people to entertain themselves in the form of downloading movies, chatting, playing games etc etc. After entertainment, it’s widely used for grabbing any particular information, or you can say for Education. The last but not the least, Internet is used for shopping purposes, people love to shop online as there are better choices for the goods available to them, with competitive rates / prices. Now, While visiting any Website, have you ever feel the need to check website ranking / reputation. We know you have thought about it many many times, in fact, while shopping this is the only question in our minds, to check website ranking or reputation before placing any order, or completing the advance payments. In these conditions, can you tell any of your favourite tool or service to check website ranking or reputation. Oops, you don’t have any, or in the process to search one. Don’t worry, Today we here for the same, to share a well known free service, to check website ranking, in a very simple way. Athough, there are many services available for the same cause BUT what about their reputation or authenticity. We can’t trust the information from any untrusted source. Here, we want to introduce this reputed online service by Alexa, where you will get each and every information, related to the website reputation. For any particular Website, you can check, its global rank, specific country based rank, top keywords, traffic sources, user behaviour and much much more. If you are thinking about Alexa’s reputation, it’s an amazon.com company. Please don’t ask us about the Amazon’s reputation, to confirm their reputation, just google “Amazon” and you will get the answer within first 10 results at google search. The good thing about using ALEXA service is, anybody can check the basic data related to any website, actually that’s enough to sense the reputation of any particular website. You don’t even have to create any account at Alexa to grab any of the information. As the ALEXA people has clearly stated on their website, that the site’s metric are estimated, which means that the data is not real and is just for the idea. Technically, we agree with their statement as nobody can access the real data elated to any website, except the site owner or administrator. Alexa also offer the pro service to check website ranking, where you will get the certified information related to the website. It’s founded in 1996, Independently. Later in year 1999, acquired by Amazon. According to some sources, it serves the traffic related data for about thirty (30) million Websites. Monthly, over 6.5 million people visit the Alexa. It’s amazing and clearly represent the strong reputation of Alexa, an Amazon company. How to Check Website Ranking Using Alexa. The are 2 ways to check website ranking, which are explained below. A)- By using Alexa Website. 1)- Go to the Alexa Website, http://www.alexa.com . 2)- Look for the search box at Top-Right section of the Alexa Website. 3)- Enter the Website url in the search box. (the website url for which the ranking data is required). 4)- Hit the “Find” button and you are with the basic ranking data about the website. B)- Direct method to check the Ranking data at Alexa Website. 2)- That’s it, You are with the ranking data for the provided website. (same as Step-A). We hope, you have understood both the methods instructed above. Use any of them according to your convenience. Let’s move to the most important section, understanding ranking data related to the requested website. Understanding Website Ranking Data provided by ALEXA. 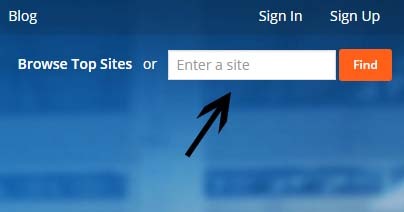 Once you have completed all the above step, you will be with the ranking data for the requested website on your screen. Now, you maybe wondering about what to do with this data, how to evaluate that for any final verdict. Don’t worry, in the next section we are making it easy for you, explaining each and every term in detail. Popularity of the Requested Website. 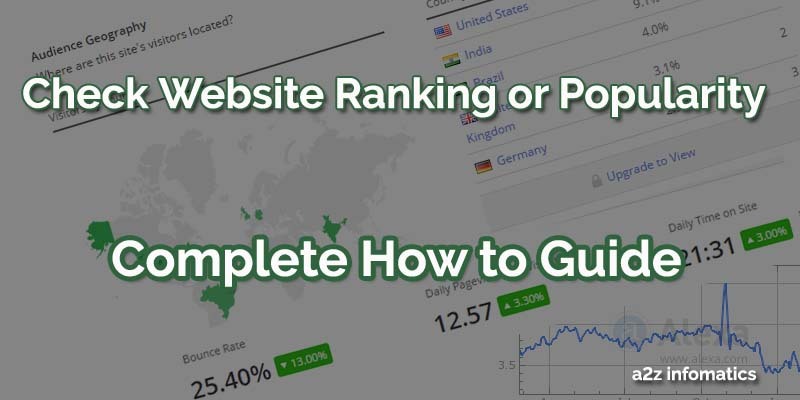 In this section, you will get the “global rank” and “local rank for any particular country in which the website is famous” for the requested website. These ranks have been calculated, using the relationship between the daily visitor & the page views to the website in the past 3 months. You always have to understand that, it’s not the real data, it’s just an estimate or assumption. Don’t worry about the term “assumption” here, in majority of the cases, these assumptions are near to accurate / real. You may see the red or green colored indicators against the ranks, don’t get confused with them too, they simply indicates the drop down or boost in the ranks, in comparison to the highest / lowest achieved rank within the last 3 months. The other best thing you will find in this section of the report, the graph view of the ranking within the last 3 months, using this you can easily analyze the ups and downs in the website performance, within last 3 months. The only sad thing about this historic graph data is that, it’s only available for the websites, which have secured their global rank under 100000. About Geography of the Audience, this section shows the top countries from where the visitors are coming to the website. In other words, it shows the rank of the website in any particular country, from where it is getting the majority of the traffic. Here, you will get the map view as well as the list view. In the map view of Audience Geography, you can easily grab the visitors percentage from any particular country. Here, the dark green shaded countries are the most visited countries, the light green represents the less visited countries. In the list view, you can have the list with % audience, in sequence of the most visited country first. Alexa updates this section once in a month. 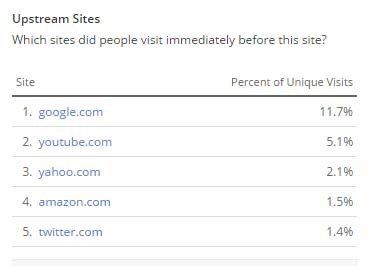 We hope, using the above explanation, you can easily estimate, the % of the visitors of any particular website, in any particular country easily. In simple words, this section tells us about the distribution of the audience of any particular website, in the whole world. This section explains about, how much the visitors are engaged with the content of the website. These section get updated daily in relation to the past 3 month data. This further has been divided into 3 parts, explanations for the same is given below. Bounce rate: This section tells us about the % of the visitor, who just have visited only a single page on the website. The more bounce rate means, the content of the website isn’t appealing, for that reason the visitor is just quiting after visiting a single page. Same applies to the less bounce rate, it means that the content is appealing, the visitor is visiting the others pages of the website too. We hope you have understood it completely. Daily Page-Views / Visitor: As you can sense from the name itself, This section shows the average daily Pageviews per Visitor on the Website. This section is important too, if you really want to know the interest of the visitors, to the website content. Daily Time on the Website: This section shows the estimated daily time by a visitor, spend on the website. Isn’t that’s easy to undertstand 🙂 . Important: About red & green indicators under the readings, As explained earlier, they simply indicates the drop down or boost in the readings, in comparison to the highest / lowest achieved readings within the last 3 months. Where do the website’s visitors come from? This section again has been divided into 2 parts, the same has been explained below. This is the most important part, here you will know the amount of the traffic in %, the website is getting by Organic Route. Mainly there are two ways, by which a visitor reaches to the website, by the organic way (search engines) and by direct way (advertisements etc). This section is helpful, if anybody wants to knows the authenticity of the website, in the eyes of the search engines. The graph view is available too for this section, to compare the search traffic to the website, within last 3 months. We don’t think, there is any need to explain about the red / green indicator against the value, the same has been explained earlier. Top Keywords from Search Engines. First of all, understand about the keywords, these are the string of the words, used to search things in the search engine. For easy understandings, Suppose you are searching the net for the Rebok Shoes, in this case, you will go the any search engine and type “rebok shoes” in the search box, here “rebok shoes” is the keyword by which you will get into the website offering Rebok shoes. Same with this section, here you will get the TOP keywords for the website, from which the website is getting the ORGANIC traffic and visitors. This section shows the list of the websites, which people visits, just before visiting to this Website. We guess, in majority of the cases it will be the google.com 🙂 on top of the list, due to its popularity & primary source of the traffic for nearly every website on this planet 🙂 . Where do website’s visitors go next? This sections indicates about the visitors directions, after visiting this website. What sites link to the website? This sections shows up the number of the websites, that has linked to this website. Technically, we call them the backlinks, which are very useful for the Search Engine Optimization purpose, and in search engine rankings. Today, you have leaned about, how to Check Website Ranking or Reputation. You can anytime download the alexa toolbar, available for all popular browsers, by which you can check any Website’s ranking with a single click from the browser itself. We hope, from now onwards, you will always Check Website Ranking, before trusting anybody over the net. We have tried our level’s best, to share everything we know about this subject, if anything left, please remind us the same, using the comments section below. That’s it, we are leaving now, Please take good care of yourself and keep visiting a2z informatics. God Bless Everybody.